I've been letting my boy get some experience on a little Taig lathe I picked up a few years back. My background is as machinist, I'm fine with teaching him how to operate it as a machinist. I don't know much about wood turning. It looks like there is enough room to make some pens? Anyone have a starter set they'd like to part with? 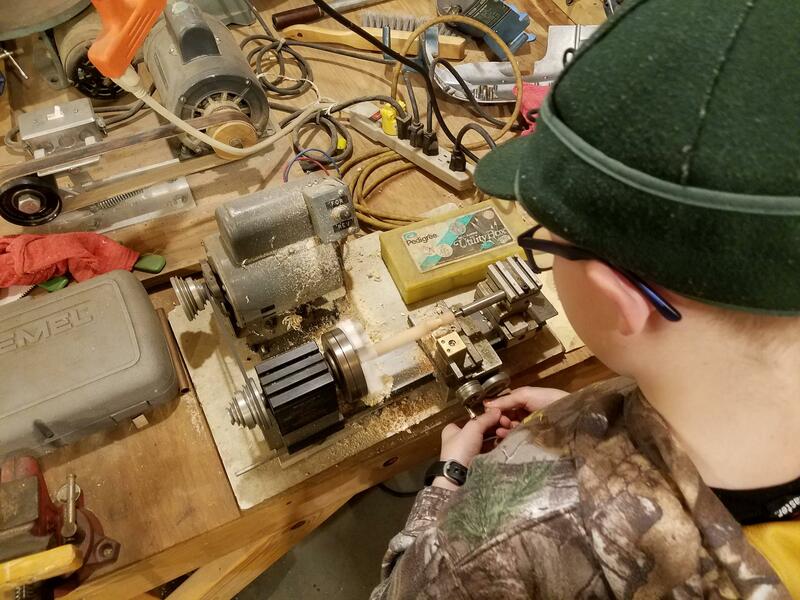 (01-18-2019, 12:37 PM)CLETUS Wrote: I've been letting my boy get some experience on a little Taig lathe I picked up a few years back. My background is as machinist, I'm fine with teaching him how to operate it as a machinist. I don't know much about wood turning. It looks like there is enough room to make some pens? Way to start him young! Figure on clearing a spot in your shop for a bigger lathe and more tools. Not sure your Taig lathe best one for turning pens but certainly doable with cutters for that lathe. How you would fashion a tool rest base & tool rest for that lathe not so sure about. Maybe if look over some pen kits and read instructions for kits that interest you guys night be able to figure out what you need. If decide might want an entry level wood lathe this might fit the bill. All of the other links also sell lathes & tools too! These inexpensive tools not bad for learning to turn and sharpen tools. Thanks for the info. You guys have given me plenty to read up on! They do sell a tool rest for this lathe for $25. I figured that and some chisels and he can start making chips. If he enjoys it, we can definitely upgrade. (01-18-2019, 05:27 PM)CLETUS Wrote: Thanks for the info. You guys have given me plenty to read up on! They do sell a tool rest for this lathe for $25. I figured that and some chisels and he can start making chips. If he enjoys it, we can definitely upgrade. No problem making pens like a machinist on that lathe designed for machining. Just need the bits and mandrels. Not enough there to really work with a rest and hand-held tools. Check the area for someone with a lathe and a spare couple hours to learn why. Fashion some kind of safety guard that sits next to that flying chuck. It will keep the palm of your hand out of it. Cletus, if you think about upgrading, I would recommend a lathe with variable speed. I have a Carba-Tech lathe from Penn State that I got around the mid-nineties and it still is in use today. They don't make the Carba-Tech anymore. I thought I had problem with the tool rest awhile back and bought a Nova mini. It is still in the box after I fixed the problem with the Carba-Tech. I have made well over 3,000 pens with the Carba-Tech. The variable speed comes in handy when you go from turning(high speed) to applying the finish(low speed) then back to polishing. At least it is handy for me. As was mentioned before Penn State has some starter kits. a press to assemble the pen when its done. I have a HF 1 ton special.